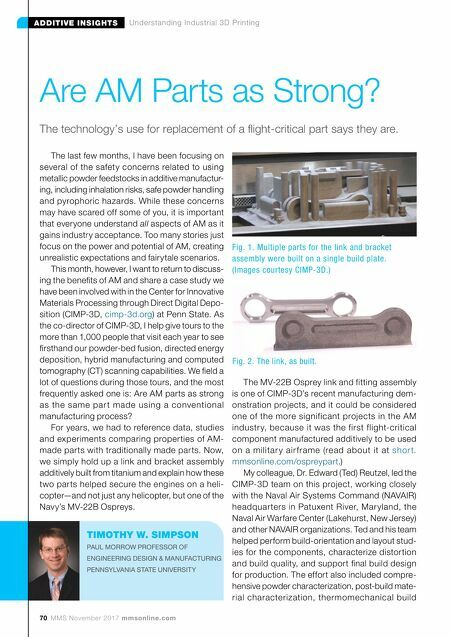 70 MMS November 2017 mmsonline.com ADDITIVE INSIGHTS Understanding Industrial 3D Printing The last few months, I have been focusing on several of the safety concerns related to using metallic powder feedstocks in additive manufactur- ing, including inhalation risks, safe powder handling and pyrophoric hazards. While these concerns may have scared off some of you, it is important that everyone understand all aspects of AM as it gains industry acceptance. Too many stories just focus on the power and potential of AM, creating unrealistic expectations and fairytale scenarios. This month, however, I want to return to discuss- ing the benefits of AM and share a case study we have been involved with in the Center for Innovative Materials Processing through Direct Digital Depo- sition (CIMP-3D, cimp-3d.org ) at Penn State. As the co-director of CIMP-3D, I help give tours to the more than 1,000 people that visit each year to see firsthand our powder-bed fusion, directed energy deposition, hybrid manufacturing and computed tomography (CT) scanning capabilities. 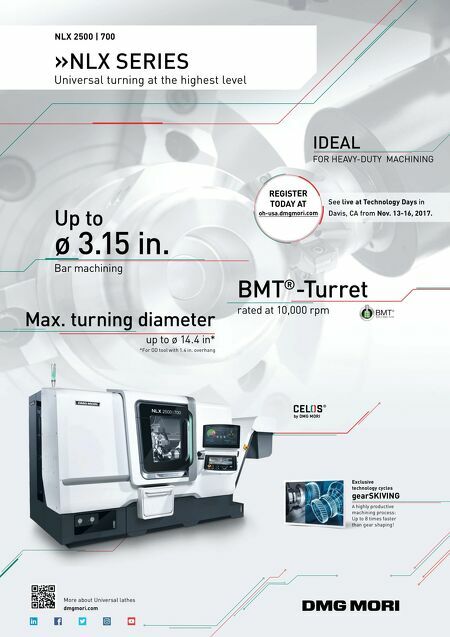 We field a lot of questions during those tours, and the most frequently asked one is: Are AM parts as strong as the same par t made using a conventional manufacturing process? For years, we had to reference data, studies and experiments comparing properties of AM- made parts with traditionally made parts. Now, we simply hold up a link and bracket assembly additively built from titanium and explain how these two parts helped secure the engines on a heli- copter—and not just any helicopter, but one of the Navy's MV-22B Ospreys. The MV-22B Osprey link and fitting assembly is one of CIMP-3D's recent manufacturing dem- onstration projects, and it could be considered one of the more significant projects in the AM industr y, because it was the first flight-critical component manufactured additively to be used on a militar y air frame (read about it at shor t. mmsonline.com/ospreypart .) My colleague, Dr. Edward (Ted) Reutzel, led the CIMP-3D team on this project, working closely with the Naval Air Systems Command (NAVAIR) headquarters in Patuxent River, Mar yland, the Naval Air Warfare Center (Lakehurst, New Jersey) and other NAVAIR organizations. Ted and his team helped perform build-orientation and layout stud- ies for the components, characterize distortion and build quality, and support final build design for production. The effort also included compre- hensive powder characterization, post-build mate- rial characterization, thermomechanical build Are AM Parts as Strong? The technology's use for replacement of a flight-critical part says they are. TIMOTHY W. SIMPSON PAUL MORROW PROFESSOR OF ENGINEERING DESIGN & MANUFACTURING PENNSYLVANIA STATE UNIVERSITY Fig. 1. Multiple parts for the link and bracket assembly were built on a single build plate. (Images courtesy CIMP-3D.) Fig. 2. The link, as built.